We all went to school and we all sat at school desks. We sat at school desks for hours and hours, days and days, weeks and weeks, months and months, and years and years. We started sitting at school desks in kindergarten and sat at them for the thirteen years of K-12. I added four more years sitting at school desks for college and then two more for grad school. Schools desks come in many shapes and sizes. An amazing moment for many adults is when they visit a kindergarten and they see the teeny tiny little desks. It's hard to imagine how tiny we once were. 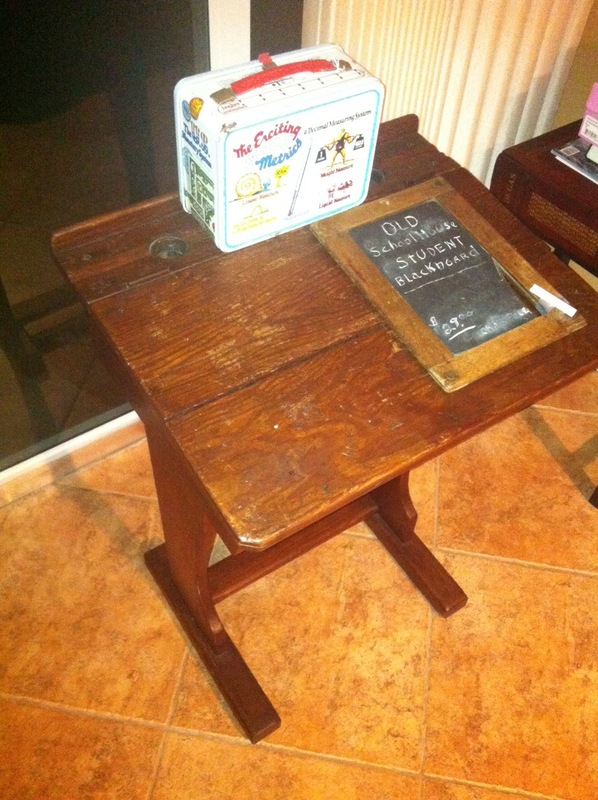 One thing that all the school desks seem to have in common is how industrial strength they were. Strong enough to stand up to years of leaning and banging. In the old days, they were attached to the floor. I have several in which the back of one row of school desk is the desk for the row behind them. When I think about school desks, I remember an odd but true story. When I was in my early 20s, I lived in a small town in Southern Cameroon called Sangmelima. I was a Peace Corps Volunteer. There was another volunteer in my town who was friends with a local carpenter who we called "Uncle." Uncle was a little less than responsible and he had a few kids and a wife with a very sharp tongue. One day as we stopped by, we heard her chewing him out for failing to come up with the money for the school fees, apparently their boy had just been sent home from school since the fees were overdue. The other volunteer and I quickly loaned him money for the fees and walked with him and his son back to the school to sort things out. It turns out the problem wasn't just the fees but as the teacher explained and pointed out, she had thirty desks and thirty students. Although he now had the cash, the seats were quite literally, all full. So Uncle turned on the charm and she finally agreed that if she had more desks and chairs, she would accept the boy back into school. So we went back to Uncles house and it only took him a few hours to build another four school desks. We marched them over to school, set them up, and she accepted him back into school. When I was young, I went to school in London and one of our subjects was penmanship. We had fountain pens that we would fill up with ink from the ink wells and try to carefully copy over our lessons. I was terrible. Ink would blot, I'd have ink all over my hands and sometimes on my desk and clothes. And that was on the days when I was trying not to make a mess, not counting the moments when they would leave us alone and we would flick ink at each other.